BVFCL Recruitment 2019 - Apply Online/ Offline for Chairman & Managing Director Post in Department of Personnel & Training, BVFCL, New Delhi on Absorption. 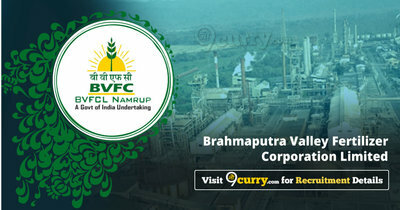 Online Applications are invited by Brahmaputra Valley Fertilizer Corporation Limited from 15 Jan 2019 to 05 Mar 2019 til 03:00 PM for 1 vacancy. The applicant should be a graduate with a good academic record from a recognized University/ Institution. Applicants holding Technical/ MBA qualification will have added advantage. The applicant should possess adequate experience at a senior level in an organization of repute. Applicants with experience in Finance/ Marketing/ Production will have added advantage. Experience in Fertilizers/ Chemicals sector is desirable. Eligible candidates may apply online at Mazagon Dock's website (direct link is given below) from 15 Jan 2019 to 03 Mar 2019 03:00 PM.